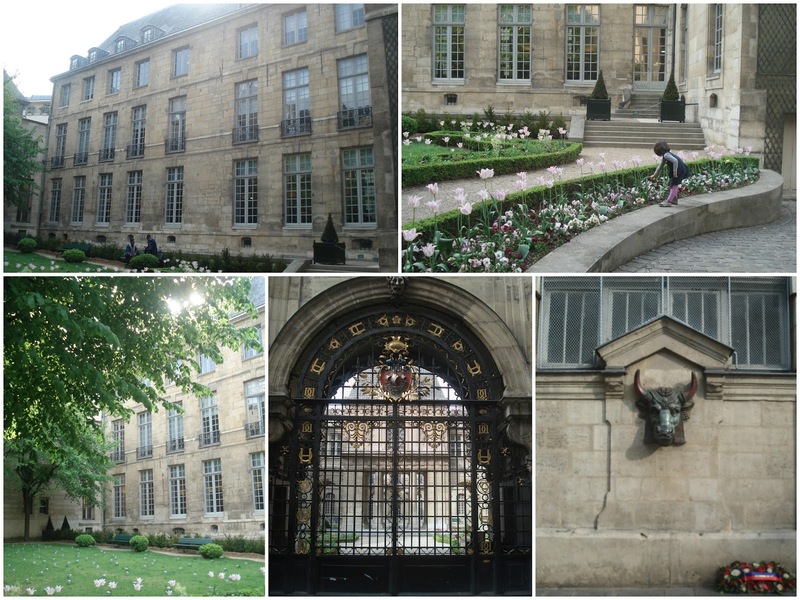 After visting Musée Cognacq-Jay, Lee and I ambled a bit through le Marais. To give Lee a break from sightseeing, we spent a fair while on the playground on rue du Parc Royal. It's spacious and clean, and though it was crowded when we went it was still easy to maintain an oversight of what the flibbertigibet was up to. After the playground, we went down rue de Sevigne, where Lee wanted everything from Petit Bateau and asked to go to Musee Carnavalet again (it was about to be closed, and I don't think her patience could have stretched that far). 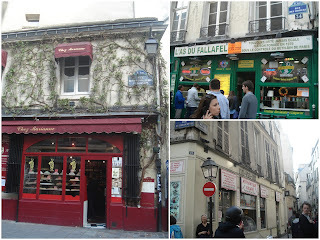 We then explored the shops on rue des Francs Bourgeois. I toyed with the idea of getting Lee some sneakers at Autour du monde Bensimon, but rejected this idea since they seem pretty overpriced for what they are - the workmanship on Toms is better, and Lee says they're more comfortable. 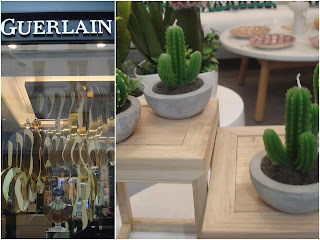 I liked the Guerlin window displays and Lee loved the cactus-shaped candles in a home decor store whose name I forgot. 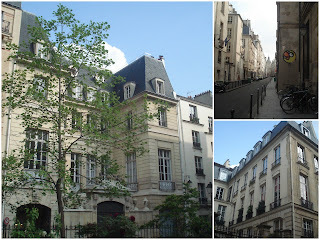 Most of the stores in this road, and actually in the whole neighborhood, are not French, e.g. Kiehl's, MAC, Ted Baker, Karen Millen, so I didn't consider it worthwhile to go in. As for French stores, I don't like the look of Comptoir des cotonniers current collection, and browsing stores like Zadig et Voltaire isn't fun with preschoolers. I don't like the term "hipster" since it seems like many people - if not the entire internet - uses it mostly to describe things they don't like, but le Marais definitely has a hipsterish vibe about it. Not to say that I mind it, as a visitor - as a resident, it might be another matter. We did discover an absolute gem: the Jardin de l'hotel-Lamoignon, also on rue des Francs Bourgeois. It's a small public park in the shadow of (as the name suggests) the hôtel Lamoignon, a hotel particulier like the building where the Musée Cognacq-Jay (and Musée Carnavalet for that matter) is housed. It's a bit of an oasis with colorful flowerbeds and benches for relaxing. For dinner, I bought falafels - I opted for Chez Marianne, solely based on the fact that I'd been there before and remembered not disliking it. There are at least two other nearby falafelrias, which as far as I could see all sold their falafels for €5.50 a piece. We met up with Nate and though we initially wanted to eat by the Seine, we settled on a playground on the corner of rue des Nonnains d'Hyreres (named after an order of Benedictine nuns who were based on this road in the 12th century) and rue de l'Hotel-de-Ville, since Lee wanted to play again and we thought the vacant benches would make a good picknicking location. This turned out to be a lot less pleasant than the rue du Parc Royal playground: there was a mild turf war between two gangs of young 'uns on the other side of the playground (I'd say 12-year-olds), glass on the ground, and a presumably homeless man caked in grime and carrying bags full of beer cans tried to entice some kids into playing tabletennis with him (they refused this offer, and this guy now ranks second in creepiness to the masturbating homeless man I saw at a Metro stop a few months ago). As for the falafels: they were the standard flatbread / red cabbage / falafel / onion / cucumber combo topped off with a less conventional tomatoish roasted eggplant. I thought it was pretty good; Lee only liked the bread and cucumber and Nate didn't care for the eggplant. We lost our appetite when Lee stepped in dog feces (also on the playground). She was terribly upset about her sneakers - and to top off her bad luck day, a bird defecated on her (for some reason missing all 6'3" of Nate and me, though we both flanked her little self) as we walked to Hotel-de-Ville to get on the Metro. It was terribly upsetting for her, but the sheer magnitude of her bad luck was sort of funny (for everyone else).